Tim Johnson 6’0”, 190 point guard joined AVC in the Spring semester of 2013 and is one of those “Manna from Heaven” players that every JUCO is looking for. He turned 21 years old this weekend so he has life experience to go with his basketball skills. A 2011 graduate from Fremont High School in Los Angeles, Tim Johnson led his team at the crucial point guard position with; 11.1 PPG, 6.1, Assists and was named First Team All LA City. Tim was recruited to Santa Monica College and was injured early in the year and sat out on a injury red shirt year. Finally completely healthy, Tim is looking to lead a very young AVC team at the point now that PG Mike Scott received a D-1 scholarship. To get some ideas what kind of player Johnson is, you can ask him whether he would rather have 10 assists per game or 15 points per game and without hesitation he would say, “10 assists.” He is a magician in the paint where he is looking to feed the “Bigs” for an easy layup or kick out the ball for an open three. No wonder his teammates love him. If there is a weakness? in his game, it is his absolute fearlessness with his body. A 190 pound block of muscle, he is constantly at 10,000 rpm and lives on the floor after taking charges, hard fouls or death death defying shots. There will be a lot of breath-holding this year to see if Tim will get up from his recent crash. Will his body survive 30+ college games? His absolute joy for the game and intense energy level turns the whole team up a notch or two. Tim is experienced and mature enough to know that he will have to battle for a starting position with a group of very talented guards on AVC’s team. There will be no “walking the ball” up the court this year and there will be times for every player on the floor will need a blow. Could this be a 11-12 player rotation year? 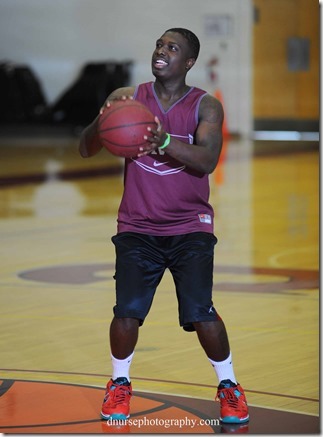 Tim brings an attitude of “team first” and point guard skill set to the AVC team that could win them a lot of games.